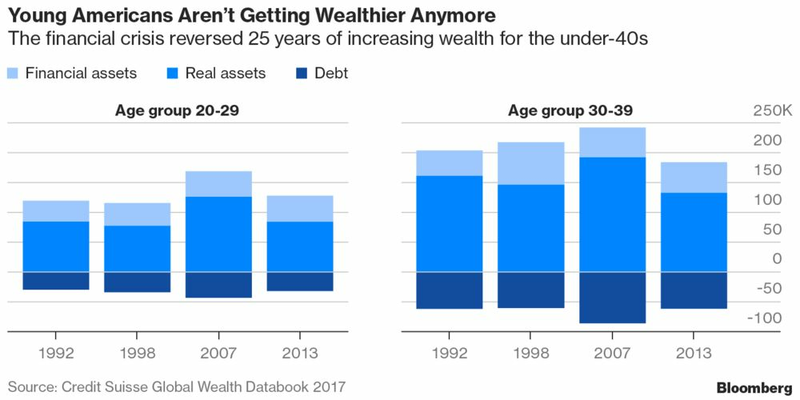 Credit Suisse's Global Wealth Report says those who came of age after the turn of the century have had a run of bad luck, and that low wealth tends to be disproportionately found among the younger age groups. Millennials get a lot of press — good and bad — but Credit Suisse reckons they should have our sympathy. Its Global Wealth Report says those who came of age after the turn of the century have had a “run of bad luck,” and that low wealth tend to be disproportionately found among the younger age groups. Comparisons with the baby boomers may not be strictly fair, but the report notes that millennials are doing less well than their parents at the same age, especially in relation to income, and home ownership. Their pension outlook is also worse than that of preceding age cohorts. “On the whole, they are not what one would call a lucky generation,” Credit Suisse said.